Discussion in 'Nikon' started by ari_davidson, Apr 28, 2011. I was out hiking the AT with my trusty FA some months ago with my Sigma 28mm-84mm macro and Tokina 400mm. I had just snapped a macro shot when a crane caught my eye in the distance, so I rushed and threw on the Tokina (foolish albeit). In my rush I managed to improperly secure the lens to the mount. Everything is flush and sealed, only about 5º off axis. This mistake threw the shutter completely out of whack, which I was able to resolve after some digging around here. Now the only remaining issue is the lens appears to be completely stuck. I've been to some local repair/pro shops but they were no help (actually clueless), and Nikon told me they don't support this camera anymore. Does anyone know how I might be able to free this lens so I won't have to scrap both? Well it's not easy but try to find a very thin piece of metal, and see if you can fit it in between the body and the lens and possibly work it off. Also, is the shutter open? Then you can look through from the back of the camera and possibly see what is going on better. It is possible that the aperture stop down lever is tangled up with the lens somehow, and in that case you might be able to get in through the back of the camera and wiggle it loose. Worse case you may have to disassemble the rear portion of the lens to free it, some of these larger telephoto lenses can split. Good luck! One possibility here is if the lens got over-rotated. This can happen sometimes if the tiny setscrew in the lens's mount falls out and you push it past the lock point. If this happens, the aperture lever of the lens gets on the wrong side of the actuating lever of the camera, and if you try to undo it you can bend the lever on the camera. I will append a picture taken down the throat of an F as an illustration. This is what the levers will look like if there is nothng wrong, with the shutter open in T or B with locked release. The len's lever is number 1. 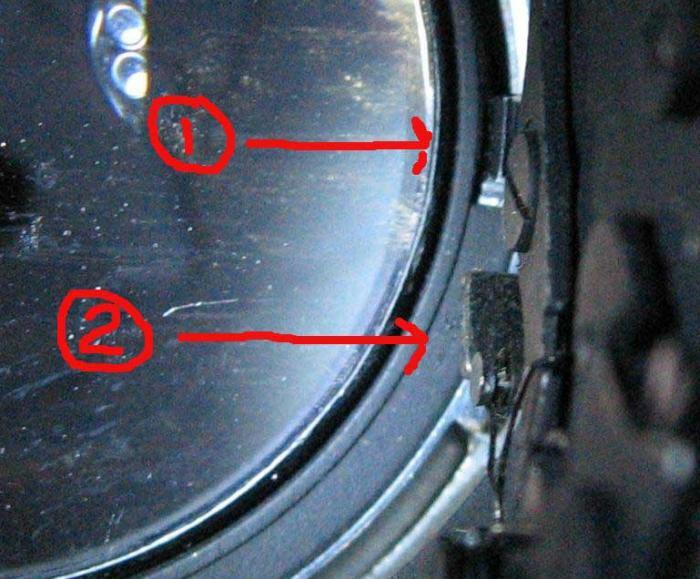 The camera's lever is number 2, and with the shutter open it has traveled downward from its rest position. If you find that the lens's lever is below the camera's lever, then your lens got over-rotated. I don't know of any easy way to extricate this except to try to force the levers past each other, probably bending the camera's somewhat. On the old F, that lever is brass and can be unbent, at least one or two times. Unfortunately, though, it cannot be pushed any further down to clear the lens. Still, there may be enough spring in the pair of them to allow you to pop it past. If this is what happened, do not reuse that lens until you have replaced the missing setscrew, or it will keep happening. Addendum to the above. If you find that the lens has been over-rotated, and if you are quite quite sure that the lens's aperture tab has already passed beneath the camera's aperture lever, it should be possible to get the lens off by continuing to over-rotate it the wrong way (i.e. in the direction usually used to install rather than remove the lens). Do not attempt this until you have checked the position of the tabs, since this will only work if the tabs have already crossed. If it looks like my picture above, the problem is not over-rotation, and this remedy will be harmful. I actually tried this with an extension tube whose setscrew was removed so that it could be over-rotated. It did indeed come off when I continued to turn it the wrong way. Thank you everyone! I've been on location since I posted this and just got home. I will give this a try. Thank you for your assistance!